Trask at his first Pet Partners evaluation. He passed with flying colors! When your parents are two halter champions that are out of some of the very best packing lines, you get to be considered for future breeding! Dad is our 100% classic herdsire, ALSA Halter Champion and PLTA Master Packer. Mom was by Rocky Mountain Jester who was an all around show, packing and driving llama. Trask's mom also descends from the Bett's packing herd. Sunshine was the 2009 NW Highpoint female and many times halter winner too! We have kept Trask to see how he matures and will be adding him to our program as a future herdsire and replacement for his amazing sire and dam. Trask is Niki's new performance llama and a registered therapy llama. So far, he is an amazing prospect! Really smart and responsive, but we expect this from this pairing. Niki can hardly wait to drive him! He is packing now already......LOVE THIS MALE! Trask's full sister "Caldera" is the 2011 ILR International Gathering of Friends Reserve Grand Classic Female, 2011 #2 UAP Top 10 Performance llama in the country, a Pet Partners registered therapy llama and drives in cart. She is also in our classic breeding program now. One of Niki's favorite llamas to work with! This line is a no brainer for what we like to do! This male is smart, steady and very reasonable. 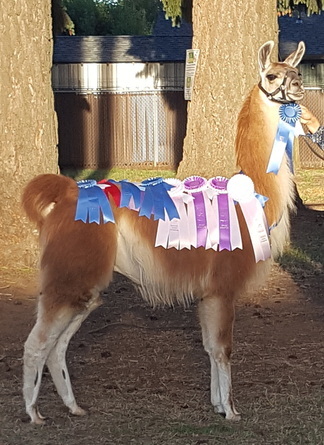 His first show out in 2016 he made a clean sweep of Novice and Maiden Performance with 19 llamas in most of the division. Trask also was Reserve Grand in Classic Male Halter behind his older half brother JNK Cayetano. Trask ended the 2016 show season with 4 Novice Performance Grand Champions (3 ILR-SD & 1 ALSA) and 1 Maiden Performance Champion win! 2017 his show season ended with him being Double Grand Champion Classic Male, Grand Champion Novice Performance, Grand Champion Coat On, ILR Western Region Champion Classic Male and Versatility Champion for the whole OFFF Show! Further cementing him into our keeper herd. He is so much fun to work with and so SMART! Next up for him is driving and packing as he will be 4 years old in June 2018.